Join Us on April 15th for Our Second Eco-Village Fundraiser! 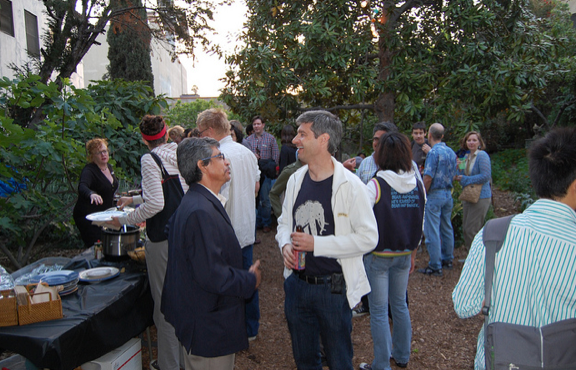 Last April, Los Angeles Streetsblog held its first ever fundraiser at the Eco-Village. It was awesome. So, we’re doing it again. On April 15th, from 6:00 P.M. until 10:00 P.M., Streetsblog returns to the Eco Village (map: here) for our second annual Spring Fundraiser. The suggested donation is $20 on a sliding scale. If you can afford to give more, that’s great. If you can’t quite afford $20, that’s fine too. We’re not turning away any Streetsbloggers that want to have a good time. At the fundraiser, we’ll have many of the things you’ve come to expect: good food and drinks, amazing people, a raffle (or silent auction, we haven’t decided) and we’ll be debuting our first L.A. Streetfilm of 2011, on the 4/10/11 CicLAvia. You may notice that our fundraiser is being held awfully close to CicLAvia, and that’s by design. In addition to our normal partying, we’ll be raising a glass to CicLAvia II, which will doubtless be one of the highlights of the calendar year. The Host Committee for the event includes, Joe Anthony, Lois Arkin, Bobby Gadda, Herbie Huff, Kelly Martin, Eric Metz, Aurisha Smolarski, Elson Trinidad, Stephen Villavaso, and Don “Roadblock” Ward. Of course, the Streetsblog Board will also be pitching in: Joel Epstein, Dana Gabbard, Joe Linton, Jessica Meaney, Deborah Murphy, James Rojas, Carter Rubin and Jocelyn Vivar. RSVP’s are helpful, but not necessary. Drop me a line at damien@streetsblog.org to let me know if you’ll be joining us. We’ll post more details as they become available. I vote for silent auction! I find raffles logistically obnoxious and slightly embarrassing for all involved. but thats just my opinion. Los Angeles Streetsblog: Eco-Village Fundraiser 2011! One Last Reminder: First Fundraiser Tomorrow Night at the Eco-Village!